The design has been used regularly ever since and, although there were mixed reactions when it made its debut, it's highly popular today. 2018 Elizabeth II Gold Sovereign are produced by the Royal Mint at its base in Llantrisant, Wales and they are struck from the same gold and copper alloy as their predecessors – 11 parts 22 carat (91⅔%) gold and one-part copper. Copper gives the Gold Sovereign its unique colour and makes the coins more durable and dent resistant. Why choose the 2018 Queen Elizabeth II Gold Sovereign? 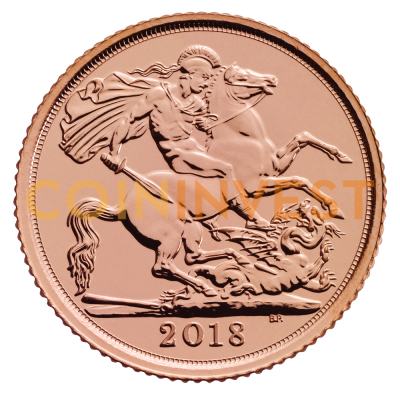 Like any legal tender British coin, the 2018 Gold Elizabeth II Sovereign is CGT (Capital Gains Tax) exempt. That means, that should you wish to sell all or part of your collection in future, any profit would be tax free. Add a true classic to your collection or choose Gold 2018 Sovereigns as an investment for the future. Add this classic gold proof coin to your collection with coininvest.com. The Gold 2018 Queen Elizabeth II Sovereign is available as an individual coin in a plastic sachet, as tubes of 25 or in monster boxes of 500. Good Quality coin. Although, I had a little issue with courier UPS. However, after tracking the item delivery notes and communicating with Coininvest it was resolved quickly. There was good Communication from Coininvest. Also, CI can be slighly cheaper than other popular bullion dealers even when delivery costs are taken into account. I would recommend this product and company.